3 "Socialist theory of racism"
12 "Blacks and Jews: Ambivalent Allies"
Cornel West is a leading U.S. Marxist academic and activist. He is an honorary chair of Democratic Socialists of America. He is the author of "The Ethical Dimensions of Marxism" (1991, Monthly Review Press). 2019 Boundary 2 Editorial Board: Charles Bernstein, John Beverley, Joseph Buttigieg, Rey Chow, Colin Dayan, Arif Dirlik, Nuruddin Farah, Margaret Ferguson, Anthony Grafton, Fredric Jameson, George Lamming, Marcia Landy, Gayatri Spivak, Wang Hui, Cornel West, Rob Wilson. In the 1980s DSA issued a pamphletby Cornel West "Toward a Socialist Theory of Racism"
What is the relationship between the struggle against racism and socialist theory and practice in the United States? Why should people of color active in antiracist movements take democratic socialism seriously? And how can American socialists today learn from inadequate attempts by socialists in the past to understand the complexity of racism? In this pamphlet, I try to address these crucial questions facing the democratic socialist movement. First, I examine past Marxist efforts to comprehend what racism is and how it operates in varying contexts. Second, I attempt to develop a new conception of racism which builds upon, yet goes beyond the Marxist tradition. Third, I examine how this new conception sheds light on the roles of racism in the American past and present. Last, I try to show that the struggle against racism is both morally and politically necessary for democratic socialists. In 1983 Cornel West was at Union Theological Seminary. 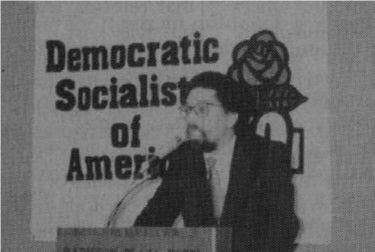 Led by Bogdan Denitch, DSA's permanent representative to the Socialist International, the Democratic Socialists of America delegation to the October 1990 Socialist International meeting in New York, included DSA Honorary Chair, Cornel West, Pat Belcon, a DSA NPC member, Motl Zelmanowicz, a "DSAer active in the Jewish Labor Bund", Jo-Ann Mort, a DSA NPC member, Jack Sheinkman, president of ACTWU, NYC Commissioner of Finance, Carol O'Cleireacain, Terri Burgess, chair of the DSA youth Section, Skip Roberts, Chair of DSA's Socialist International Committee, welcomed the Council to the United States on behalf of Democratic Socialists of America. In 1992 Cornel West was a member of the Democratic Socialists of America Racial Diversity Task Force - charged with finding ways of recruiting (and retaining) more "people of color" into the organization. New Party News Fall 1994 listed over 100 New Party activists-"some of the community leaders, organizers, retirees,, scholars, artists, parents, students, doctors, writers and other activists who are building the NP" the list included Cornel West, Harvard. "Blacks and Jews: Ambivalent Allies"
A four hour radio series looking at ethnic identity, stereotypes, racism and anti-Semitism, the Civil Rights Movement, and the potential future cooperation and conflict between the two ethnic groups. A cultural journey through music, storytelling, poetry and interviews throughout the U.S. With Cornel West, Michael Lerner, Henry Louis Gates, Letty Cottin Pogrebin, Anna Deavere Smith, Steven Spielberg, and Patricia Williams. 'Making Trouble- Building a Radical Youth Movement' was held April 17-19, 1998 Berkeley, California. 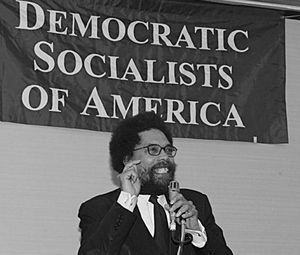 In 1998 African American Commission the of the Democratic Socialists of America was led by Cornel West, chair , Shakoor Aljuwani, convenor Lynne Mosley Engelskirchen, convenor. In March 1998 “Endorsers of the Call” to found a Black Radical Congress included Cornel West, Cambridge, MA. Individual endorsers of the event included Cornel West. In February 1999, the Harvard Progressive Student Labor Movement launched a four-month living wage campaign for Harvard employees. Its members based their demands on a distinction between the federal minimum wage ($5.15 per hour at the time) and a wage considered “livable” in a specific city of residence (then set in Cambridge at $10.25 per hour, plus benefits and adjustable for inflation). A report released by Harvard on Feb. 20, meant to stymie any outcry, revealed that only 2.7 percent of Harvard’s “regular employees”—those who worked more than 17.5 hours a week—made less than $10 an hour.The report had the opposite effect. Supporters of PSLM’s campaign latched onto the data showing that 49 percent of Harvard’s “casual employees,” its part-time or temporary workers, made less than $10 an hour, often with no benefits. They also called into question Harvard’s increasing reliance on outsourced, subcontracted workers, who were not included in the data. Throughout the winter of 2000 the Harvard Living Wage Campaign continued to gain steam, bolstered by the support of prominent faculty, such as then-Du Bois Professor of the Humanities Henry Louis Gates, Jr., and then-Fletcher University Professor Cornel West ’74. By April, then President Neil Rudenstine promised to assemble an Ad Hoc Committee on Employment Policies.Yet, 13 months later, PSLM was less than satisfied with the Committee’s results. It recommended against increasing wages for Harvard’s workers, instead promoting the expansion of free education programs and the official launch of Harvard’s Bridge to Learning and Literacy. In 2000, Cornel West, was a co-chair of the Bill Bradley primary campaign. 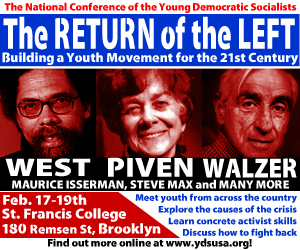 Liza Featherstone of The Nation, Cornel West, Adolfo Gilly, Hilary Wainwright of Red Pepper and Stanley Aronowitz were speakers on the opening plenary, Forgoing a Radical Political Future at the Left Forum. The forum was held March 9 - 11, 2007 at Cooper Union College, New York City. Religious Socialism is the journal of the Religion and Socialism Commission of Democratic Socialists of America. In the late 2000s it was edited by Andrew Hammer. Contributing editors were Maxine Phillips, Harvey Cox, Cornel West and Michael Eric Dyson. West is a contributing editor of Sojourners. 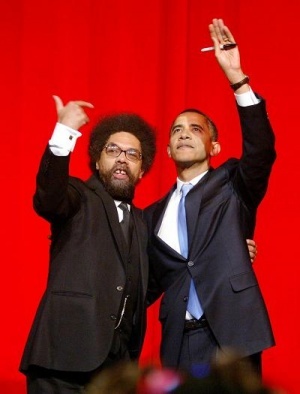 Barack Obama called on Charles Ogletree and Cornel West, during his 2008 Presidential campaign. Ogletree and West both joined Obama's Black Advisory Council. Ogletree has advised Obama on reforming the criminal-justice system as well on constitutional issues. He is a member of the Obama campaign's black advisory council, which also includes Cornel West, who teaches African-American studies at Princeton University. The group formed after Obama skipped a conference on African-American issues in Hampton, Va., to announce his presidential candidacy in Illinois. In 2009 Cornel West Author, 'Race Matters' was listed as a signer of the Progressives for Obama website. 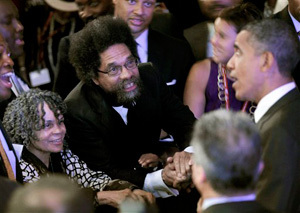 President Obama shook hands with Princeton University professor Cornel West after speaking at the National Urban League’s 100th Anniversary Convention in Washington in July 2010. In 2008 Cornel West, Professor at Princeton University, Princeton, NJ signed a statement circulated by the Partisan Defense Committee calling for the release of convicted “cop-killer” Mumia Abu-Jamal. As of 2009 Cornel West served as a sponsor of New Politics, magazine almost completely staffed and run by members of Democratic Socialists of America. Supporters of convicted cop-killer Mumia Abu-Jamal responded to the April 2009 U.S. Supreme Court ruling by launching a campaign (freemumia.com/civilrights.html) calling for a federal civil rights investigation into Abu-Jamal’s case. The campaign’s supporters include the Riverside Church’s Prison Ministry [New York City], actress Ruby Dee, Professor Cornel West and U.S. Congressman Charles Rangel, who was then Chairman of the House Committee on Ways and Means. West is listed as an endorser of the Campaign for Peace and Democracy, as of March 15, 2010. Tavis Smiley organized and hosted a forum, held on Saturday, March 20, 2010 at Chicago State University on the city’s South Side. The confab offered up a provocative query: Is there room for a black agenda in the “post-racial America” of Barack Obama? The televised event drew about 3,000 people, heard Smiley lead a four-hour conversation among 12 black intellectuals, educators and activists. The mix included longtime Smiley compatriots, academics like Cornel West, Michael Eric Dyson and Julianne Malveaux. Others were longtime black leaders like the Rev. Jesse Jackson Sr., and Nation of Islam Minister Louis Farrakhan. Most of them came, they said, to “lovingly” take Obama to the woodshed. In 2010, Cornel West, Ctr for African American Studies, Princeton Univ., was listed as serving on the advisory board of the Democratic Socialists of America dominated National Jobs For All Coalition. Friday, SEPT 14. 7PM. RIVERSIDE CHURCH NYC. On the day following the 41st anniversary of the Attica ¬massacre of courageous prisoners rising up against intolerable oppression, we come together to fight mass ¬incarceration and to demand the closing of Attica as a symbolic commitment to this larger goal. We build on the powerful commemoration that took place last September 9, 2011 at Riverside Church. Join with us to hear a special panel on building a movement to end mass incarceration with: Michelle Alexander, Angela Davis, Jazz Hayden, Marc Lamont Hill, and Cornel West. Speakers: Soffiya Elijah, Pam Africa, video message from Special UN Rapporteur on Torture, Juan Mendez, and audio message from Mumia Abu-Jamal. Occupy Wall Street has been heating up in New York and around the country. DSA honorary chair Cornel West was arrested on the steps of the Supreme Court as part of an Occupy DC protest against the Supreme Court's "complicity in unfettered corporate financing of politicians". The New York Times quoted DSA vice-chair and National Political Committee member Joseph Schwartz and Young Democratic Socialists (YDS) Northeast Regional Organizer Cecily McMillan about Occupy Philadelphia and #Occupy Wall Street respectively. 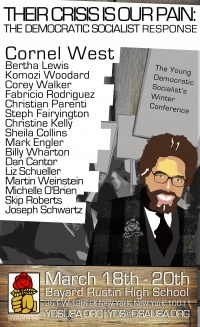 Cornel West was a guest speaker at the Young Democratic Socialists 2012 Winter conference. Dr. Cornel West is a prominent and provocative democratic intellectual. He is Professor of Philosophy and Christian Practice at Union Theological Seminary and Professor Emeritus at Princeton University, where he also received his PhD. He is the author of 20 books and is best known for his classics, Race Matters and Democracy Matters. He recently co-authored a book with Tavis Smiley, titled, The Rich and the Rest of Us: A Poverty Manifesto. He is also honorary chair of the Democratic Socialists of America. August 2015, dozens of protesters were arrested Monday outside the U.S. attorney's office in downtown St. Louis during a demonstration against police brutality. DeRay Mckesson and Johnetta Elzie -- prominent activists in the Black Lives Matter movement -- were among the 57 people detained during the sit-in. They were released after being issued a summons alleging obstruction of the courthouse doorways, U.S. Attorney Richard Callahan said in a statement. The rally, which Callahan said included as many as 200 people, was a part of Moral Mondays, a nationwide social justice movement that began in North Carolina in response to the state legislature's conservative shift. The campaign moved to St. Louis this week, calling on the Department of Justice to take action against police violence toward black people. With Al Osorio, Jeremy Miller, Christopherj Woods, John Earl Boyd, Jose LaSalle, Derk Brown, La Mesha Irizarry, Osagyefo Sekou, Dr. Cornel West, Efia Nwangaza and Patrick Soby. REFUSE FASCISM is an anti-Trump project of the Revolutionary Communist Party. This page was last modified on 13 March 2019, at 18:38.